Sanyo 's Xacti range of tiny camcorders has been around for a few years now, with minor spec tweaks appearing every six months or so. 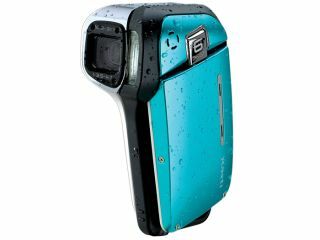 But the latest model takes things a step further by being the first ever fully waterproof video camera. Available initially in the US and priced at $500 (£255), the Xacti E1 is mostly similar to the splash-proof CA6 model that's available worldwide. But it has a larger screen and that new seafaring ability that allows it to withstand submersion in five feet of water for an hour. As you may have noticed, five feet is not very impressive. After all, how many people would want to limit their submarine photography to the shallow end of a swimming pool or the bottom of the kitchen sink? In other words, what's the point? Waterproof enclosures for existing cameras are both cheap and efficient, so we're not sure what Sanyo is hoping for here. Putting that minor gripe (about an underwater camera not being much use in the water) aside, the hardware is still worth a look. The 235g E1 sticks with the typical Xacti pistol grip and can shoot 6-megapixel stills at the same time as laying down H.264 video onto an SD/SDHC card. An 8GB card will, apparently, hold up to 10 hours of 30fps 640 x 480-pixel video. Otherwise, there's a 5x optical zoom, a fold-out 2.5-inch LCD screen, image stabilisation and a choice of colours - blue, white or yellow. We'd recommend ignoring the anti-H20 aspect of the E1 and considering it for what it is - a fun little pocket video camera.